Geek Grotto - Get Your Geek On! : A Win Win For Anime Fans? Crunchyroll and Funimation Working Together? A Win Win For Anime Fans? Crunchyroll and Funimation Working Together? In news that literally came out of left field today, Crunchyroll and Funimation have partnered up for what could be the best thing for anime fans in recent history. 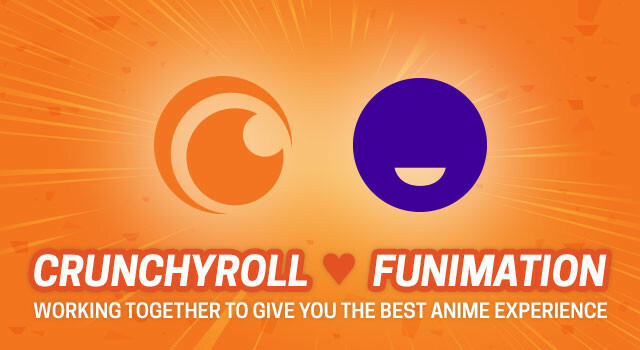 As of TODAY, all of Funimation's subbed simulcasts will be streaming on Crunchyroll, and all of Crunchyroll's subbed titles will make their way to Funimation Now, Funimation's streaming service. Now, this isn't all happening overnight, but the endgame is that Funimation will be streaming dubbed anime with Crunchyroll handling subtitled anime. This is GREAT, as now you do not have to sign up for both services if you want only subbed or dubbed anime. Now to see if Neon Alley, Daisuki (which does license some title to both both Crunchyroll and Funimation), Amazon and Netflix to work together for the greater anime good... A guy can dream. Read up and find out more from Crunchyroll and Funimation and they both have FAQ's up for you all to catch up on.